Sunbury Mayor Tommy Hatfield speaks at the Chamber of Commerce’s quarterly breakfast. 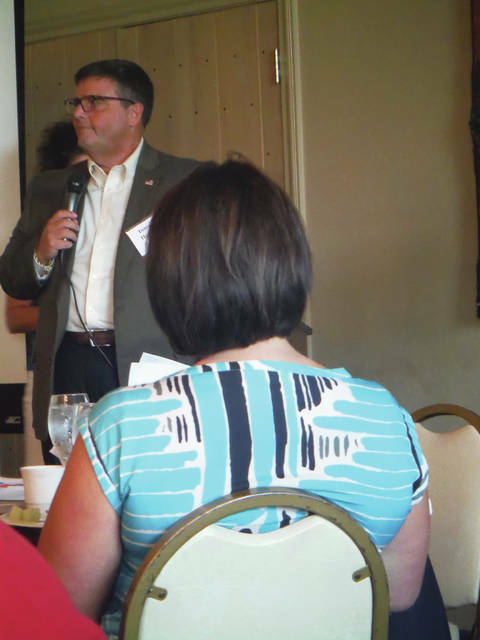 A growing Sunbury, an upcoming ballot issue, and a canine program were the topics of discussion at the recent Sunbury/Big Walnut Area Chamber of Commerce’s quarterly membership breakfast. Among the “hot topics,” Hatfield said, was a proposed new interchange off of Interstate 71. As far as what’s happening in the village, Hatfield mentioned 150 apartments near Sunbury Plaza, which will open mid-2018, and the Sunbury Meadows development. Pollock said the district is working on a partnership with Otterbein University in Westerville to connect classrooms with local businesses. Continued growth in the area means higher enrollment and more space needed for students, necessitating going on the ballot in November for a new high school. If voters approve the combined $108 million bond issue and 1.25-mill permanent improvement levy, the district would also build a new elementary school, with middle school students moving to the current high school. The middle school would become the intermediate, and the current intermediate would become an elementary. In addition, security would be improved at the entrances. Academically, Pollock said the district did improve in several areas at a higher rate than the state’s standards. The department would like to acquire a German Shepherd to search for narcotics and track suspects or a missing person, Landis said. It would cost $10,000 to $12,000, with more than half that amount spent on training this September and October. Kevin Kline, assistant fire chief of BST&G Fire District, said the station handles Sunbury, Galena and Berkshire and Trenton townships. He said that a station remodel was being completed, and because of a May levy passage, the district is in good shape for another five years.